What are the best ways to limit towel consumption? 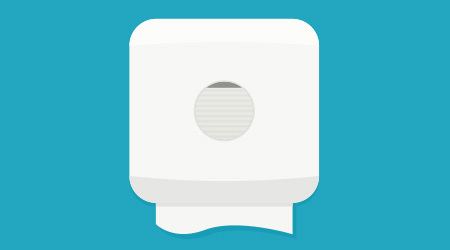 Are certain types of dispensers or towels better to use than others? One-at-a-time towel dispensing can help minimize a facility’s overall environmental impact through waste reduction. For example, certain types of touchless towel dispensers can help reduce waste by up to 30 percent versus standard folded towels through controlling usage. First, you have to determine the type of venue: Is it high traffic, low traffic, a school, is there food processing, etc. A universal statement relative to controlled consumption is that you want one-at-a-time dispensing — portion control with minimal or no chance of cross-contamination. Having electronic, mechanical, hands free, or center pull dispensers and corresponding towels installed and maintained properly can all reduce consumption. A reduced environmental footprint can be reached by using the proper dispensing systems in restrooms, which allow a significant diminution of paper waste. A dispensing system is a sustainable and cost-effective choice for roll towels. Roll towels are heavier and more absorbent. Controlled dispensers offer ease-of-use, reliability and durability. These dispensers allow lower cost per hand dry, decrease labor costs, provide hygienic dispensing and reduce waste because of their controlled paper release feature. What are the benefits to switching to coreless toilet tissue? One of the most significant benefits of coreless bath tissue is the reduction of overall waste. For example, certain types of coreless tissue help reduce overall paper and packaging waste by using no boxes, cardboard cores or individual wrappers, which equals 95 percent less packaging than standard bath tissue. Do you foresee more facilities composting their hand towels? The composting of paper towels is increasing in the institutional environment, but it will make up a relative small percentage of recovery as compared to other post-consumer fiber. At the end of the day, recovery does best when the economics and sustainability overlap. Are all towels compostable? How long do they take to break down? Paper towels that are wet but are not contaminated with chemicals are compostable. Receptacles that contain towels for drying hands and chemical cleaning are suspect.